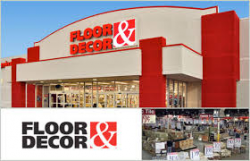 Floor & Decor is a leading specialty retailer in the hard surface flooring market, offering the broadest in-stock selection of tile, wood, stone, related tools and flooring accessories - at everyday low prices. The company was founded in 2000 and is headquartered in Atlanta. We are looking for some motivated, hard working individuals, that want to get a career started with a rapidly growing company with lots of upward growth. No experience is necessary but is always encouraged.